This is fantastic. I lived in Milledgeville in the late 70s/early 80s and we would drive over to "Swampland" on Saturday nights for fried fish dinners and awesome bluegrass/gospel shows. Great memories. Nice photos and info...thanks! Flannery O'Connor directly references Toomsboro in her classic short story, "A Good Man Is Hard to Find." Worth a movie set or two, indeed! Long live Toomsboro! Ummm....anybody talk to Dolly parton about this? She may like an idea like this...Imagine a new Dukes of hazard being filmed here? yeah buddy! Who can sell a town? Who gets paid? How was the cost determined? Wow! This is bizarre! Toomsboro sure looks to be in great condition...for as old as it is. Maybe a railroad spur could be built closer to town to expedite visitors from Macon and elsewhere? Once in a while I get over and down that way, (Valdosta), and next time I will go see Toomsboro. Somehow this little burg captures the imagination. It would be great if "NativeGates" idea about Dolly Parton took hold. I will pray that it does. I will say this about the towns folks and owner: They sure have taken good care of this treasure. Well done folks and good luck on making Toomsboro a profitable enterprise. But please! Don't get too greedy about it. Its only 85acres for sale. Which is just 1/3 of Toomsboro. Many people have lived there and worked hard to pay for their homes which they own and are not for sale. So no, its not the whole town. This guy can't sell the whole town because he doesn't own it all. 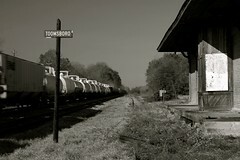 I discovered the town of Toomsboro when I was an undergraduate student at Mercer University in Macon, GA in 1993. I fell in love with the town and did a photo essay on the town for one of my photography classes. There is so much character in that little town & it was so easy to capture some amazing photos there! Nice photos. My husband has had a custom cabinet shop in downtown Toomsboro for more than 20 years. He has always said, "he's the best kept secret in Toomsboro". i think the same thing, I was looking to keep the old character, and restaurant, and hotel, and travel and tourism. People are always looking for nice places to have weddings or parties, and you can use items from locals to sell in store. were can we find the information? Been there several times. I lived in Tennille GA, a railroad town that the Nancy Hank came through. I sang with a group at Chalkland, in Deepstep GA.
My daddy was a little boy back then and his mama ran that hotel in its original venue. He was a "star" at the Swampland Opera for several years. You know, when the Dukes of Hazard began filming in our neck of the woods, John Schneider used to come down and play the guitar and sing on my daddy's program. I wish someone could buy this place and put it on the map. It deserves it. Even Flannery O'Conner writes stories about this weird place on the map. 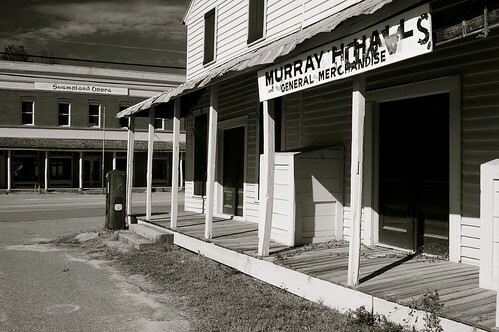 I grew up in this town during the 1940s & 1950s. Great little town then. My father had a hardware store in part of the swampland opera space. Most people knew him as "Boonie" & he was quite a character. I am in the process of writing a book entitled Boonie which is all about his life experiences in Toomsboro plus all the characters that made up the town. It will be, in my opinion, one of the funniest books ever written. My hope is that it will become a movie & will be filmed in Toomsboro. My grandmother (Martha Jane Lord) was from Toomsboro and would love to find more information about the town and visit soon! My last name is Hall So when I saw a signed print of Halls General Store at a yard sale, I bought it. I just found the info about it on this site. I will print the info and put it on the back of the picture, so hopefully my kids will not sell it after I am gone. Thanks so much for your wonderful history. Barbara Hall Ocean Isle Beach, NC. My grandmother and grandfather ran Bear Camp lake in Irwington,Ga. I would ride my bike to Swapland early Saturday morning and spend the day riding with friends there. We'd waited for the people to start coming in for the shows. I wish that Ole bike had a odometer. lol The Good Ole Day's. Oh and the catfish dinners was awesome. I think that's the main reason my grandmother was able to get Granddaddy to go. Of course we did team up on him. Great little town. Would love to see revunue to come back to the town. Big B I lived on Bear Camp Rd in Irwinton for about 3 years (1963 - 1966) and remember the camp fondly! My step-grandparents lived in Toomsboro so I was there a good bit and remember going to Swampland once. I moved my cabinet shop to Toomsboro from Atlanta in 1988. Despite many raised eyebrows and shrugging shoulders (and admittedly some self doubt), I loved the feel of the town and thought it would be a good fit for my shop. My father,Brett Bacon, and Joe Boone were life long best friends so Toomsboro and I were familiar. The Swampland days were so full of local folks and with each one a treasure chest of tales. Joe Boone offered me a 3,000 sq. 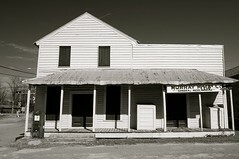 ft. portion of the old Swampland Restaurant building with two years lease free as incentive. The building required much work but with some persistence and good help we made the transition. Within a few months, my father mentioned that he had loaned Joe some money and would I be interested in buying the building. The price was right and Daddy showed me the napkin (that's right) that he and Joe had signed and used as a promissory note; a deal they had made years earlier at the restaurant. The legal papers were prepared and signed and I've been the owner ever since. For the most part I've operated as a "one man shop" over the years but have had the help of some good folks during this time. 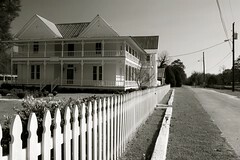 Toomsboro is unique and even though the long hoped for stimulus hasn't occurred, the town has been able to hold it's own. Robert Toombs was my great-great uncle (maybe another great). I knew there was a Toombs County in Georgia, but didn’t know of the town until I watched the news while in California, and they mentioned you could by the whole town at about the price of a home in San Francisco. Robert ran against Jefferson Davis for the Presidency of the Confederacy. He did work a short time for president Davis. I learned something new today. What a fabulous opportunity for someone to purchase this quaint little town! I'd do it in a heartbeat if I could. I truly hope that whoever purchases it can breathe a little new life into it. Would love to see those amazing old buildings filled with townsfolk and visitors alike once again. Long live Toomsboro! !